Alura Flores de Angeles was a woman who was ahead of her times. She was born in 1905 the daughter of an indigenous man from Xochimilco and an American born Protestant missionary. At a time in Mexico when more than 50 percent of the population was illiterate, Flores de Angeles graduated from the National Preparatory School in San Ildelfonso in 1924. She was a star athlete who participated in the swim, volleyball, and basketball teams. She graduated from the Universidad Nacional Autónoma de México (UNAM) majoring in Physical Education. Flores de Angeles stated that as part of her Physical Education training she learned Mexican folkloric dances. Flores de Angeles earned the title of Professor of Physical Education from UNAM and Profesora Normalista from the National School of Teachers. She would later become an accomplished at poetic recitation and would coach women’s volleyball and basketball teams. Her volleyball team competed in six national championships and she accompanied them to represent Mexico in at least two Olympics. Although, her recitation and athletic contributions are enormous, her love and passion for folklorico dance is of equal importance. In 1928 or in the early 1930’s, while a teacher within the public education system, Flores de Angeles was hired as a Physical Education teacher to teach in Mexico’s Cultural Missions in rural areas such as Tuxtla Gutiérrez and San Cristóbal de las Casas in Chiapas, Mexico. She is most famous for having documented the dance called El Bolonchon from Chiapas, Mexico. Flores de Angles taught folklorico at the UNAM for over fifty years. Flores de Angeles started the Yolo Xochitl dance group comprised of students from UNAM. She also organized a folk dance camp held bi-annually in Oaxtepec, Morelos, Mexico, known as Festivales Folklóricos Internacionales. She taught Mexican folkloric dances in the European cities of Stuttgart, Hamburg, Berlin, Zurich, and Vienna. She also taught folkloric dance workshops sponsored by UNAM in San Antonio, Texas for many years. She was a regular teacher at the Folk Dance Federation and Folk Dance Camps held in California and Texas. 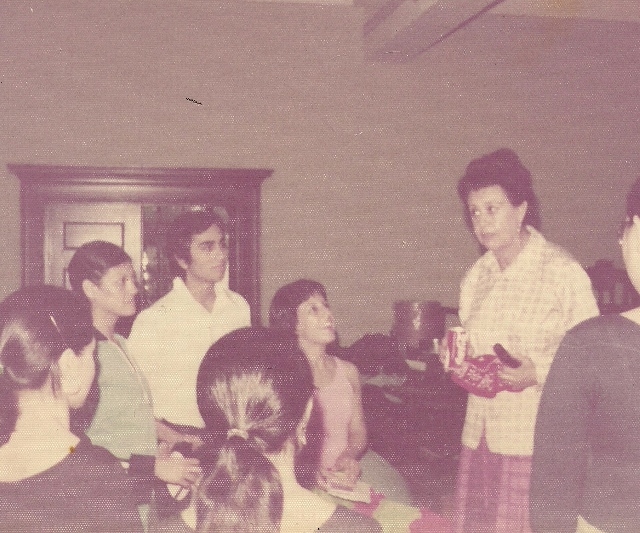 Alura Flores de Angeles teaching students from El Grupo de Danza y Arte Folklorico de la Universidad de Tejas en Austin in 1972. Pictured are faculty advisor Sanjuanita Martinez-Hunter Ph.D., and Roy Lozano. Photo courtesy of Sanjuanita Martinez-Hunter Ph.D. I did not ever have the opportunity to learn directly from Alura Flores de Angeles because her last visit to the University of Texas was just about three years before I enrolled there. Yet, she taught my dance teachers Sanjuanita Martinez-Hunter Ph.D. (dance professor), Michael Carmona (UT Ballet Folklorico) and Roy Lozano (Roy Lozano’s Ballet Folklorico de Tejas). I feel that her spirit, passion, and teachings have been passed onto me by my own teachers. Perhaps when I break down the dance steps slowly or when I vividly describe the customs to be taught or even sometime when I am at my computer writing, my bodily actions invoke this remarkable woman! This entry was posted in Chicano, dance, folklorico, Mexican culture, Mexico and tagged Chicano, dance, folklorico, Jarochas, Mexican culture, Mexico. Bookmark the permalink.